Mangroves are coastal forests that grow in the tidewater of tropical and semitropical regions. For a mangrove swamp forest to flourish, it requires a tropical climate, saltwater, tidal movement and a substrate of fine grained silt, according to "The Ecology of the Mangroves of South Florida." Mangrove trees require a specific set of conditions to grow. Under the stilt roots of mangrove trees, a diverse array of plants and animals live. 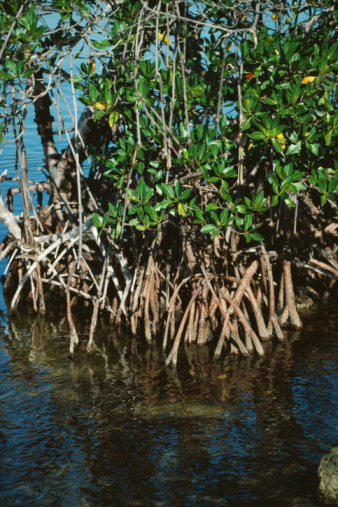 The distinctive structure of the mangrove tree roots provides a safe haven for birds and fish to construct nests and breeding areas protected from predators. According to the National Zoo, 69 different species of animals can only be found in the mangrove forest. The deep-reaching roots of the mangrove trees help to keep the soil of the coastline in place, preventing erosion. This preserves the natural shoreline without the need for artificial barriers such as seawalls. 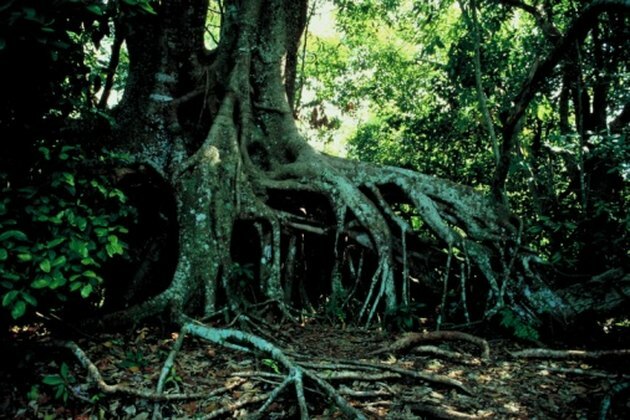 The structure of the roots helps to soften the blow of the waves, which protects any man-made or natural structures on the opposite side of the mangrove. Planting mangrove species into another region where they do not grow natively can produce trouble for the native species. The imported, exotic mangrove becomes an invasive species and takes over the nutrients of the natural plants. 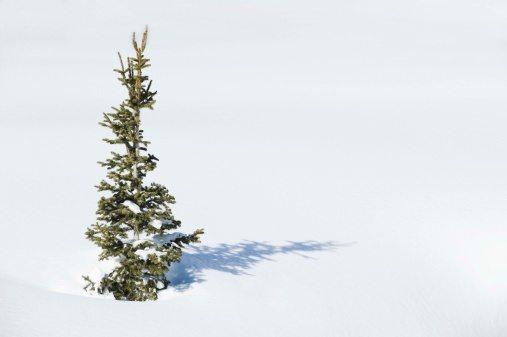 This disrupts the local ecology. Such a problem occurred in Nigeria when a mangrove species, the nipa palm, was imported from Singapore to Nigeria in 1906 to control coastal erosion. The nipa palm took over and eventually replaced the native species of trees in the Nigerian mangrove swamp. Pools of stagnant saltwater in mangrove swamps, particularly in areas where black mangroves grow, are a ripe breeding ground for mosquitoes. These mosquitoes are both pests to humans and potential disease carriers.